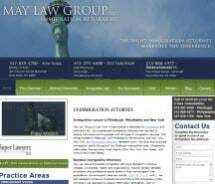 May Law Group, a Pittsburgh, Pennsylvania, New York immigration law firm, was founded by Valerie May, an accomplished immigration attorney. May Law Group is dedicated to representing individuals, families and corporations in their immigration law needs. Unlike many law firms that practice immigration law as part of a larger practice, May Law Group is exclusively devoted to the practice of immigration law. This focus enables the firm to apply their full resources and energy to each individual case. At May Law Group, we believe in helping people accomplish their immigration goals through a dedication to hard work, individual attention and excellence. We know how important immigration issues are in our clients' lives. We are prepared to devote our full energy to each individual and each case to help our clients achieve their dreams. For a free consultation to discuss your immigration needs with a dedicated immigration law firm, please contact us online or call 412-291-4400. We are here to serve you and clients throughout the United States, including Pittsburgh, Pennsylvania, West Virginia, Western Pennsylvania, Eastern Ohio, Allegheny County, and worldwide in Korea, Africa, India, and Pakistan.